This evening I got to go to St. Louis Church for an actual Tridentine Mass that included the Pope Marcellus Mass by Palestrina. Is Buffalo a great town or what? Where else in the world would this happen? The Palestrina Mass was sung by Harmonia and the Choir of St. Joseph Cathedral. I wrote about it Friday in Gusto. They are performing it in concert next weekend so if you missed it all is not lost. The only thing was, today it was part of an actual Mass. It was beautiful and one thing that was beautiful was something that took me completely by surprise. There were torchbearers! I saw Torchbearers listed in the kind of program we were given but I did not know what they were. My sister Katie and I were pointing at it and wondering. When we forgot about them suddenly they appeared. Isn't that how things work in life? You are zeroed in on something and get nowhere with it and as soon as you forget about it, there it is, your answer. The Torchbearers filed in at the Consecration. They were a parade of, I want to say eight men. I did not think to count. I was just staring. They filed in carrying candles in red glass holders and arrayed themselves across the sanctuary. I got tears in my eyes. It was an unbelievable sight. It is hard to see the Torchbearers in this picture but if you click on it you will be able to make them out. They are at the front of the sanctuary holding their red candles. St. Louis is a beautiful church! I love the statue of St. Louis at the front, in his crusader's outfit, holding his sword. That and the music of this Mass, just heavenly. The video above is of the Creed. I like this video because it walks you through the words. Anyway, today, it was what it was promised, like going back in time. It was as if you were Shakespeare going to Mass. This must have been something like what he saw, and heard. My nieces Rosie and Millie went too and they are something like 11 and 13 so they were a little young for something this long and involved. But they got through it and were even taking pictures. This was funny too. On the way out they were talking excitedly about how they wanted mantillas and what color would they get. 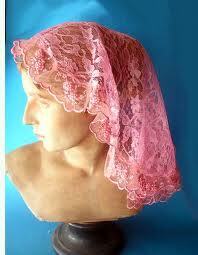 I said I was thinking of ordering a pink mantilla. They come in pale pink. Rosie who is sophisticated said, "I am not a pink person." She said, "I think I would like black." Like her Aunt Mary! She likes that Floria Tosca look the way I do. Leonard Pennario loved the Tridentine Mass and I am sure he would not mind my taking time out to discuss this. I just wish I had taken better pictures. In my haste I had forgotten my camera and I took the above picture with my cell phone. I must always carry my camera. Howard tells me that all the time. You cannot lead a life like mine and not carry a camera! This indeed was a very rare musical and liturgical treat. About 15 of us came from Rochester to experience this highest form of well-executed liturgical worship. St. Louis is just an amazing church. 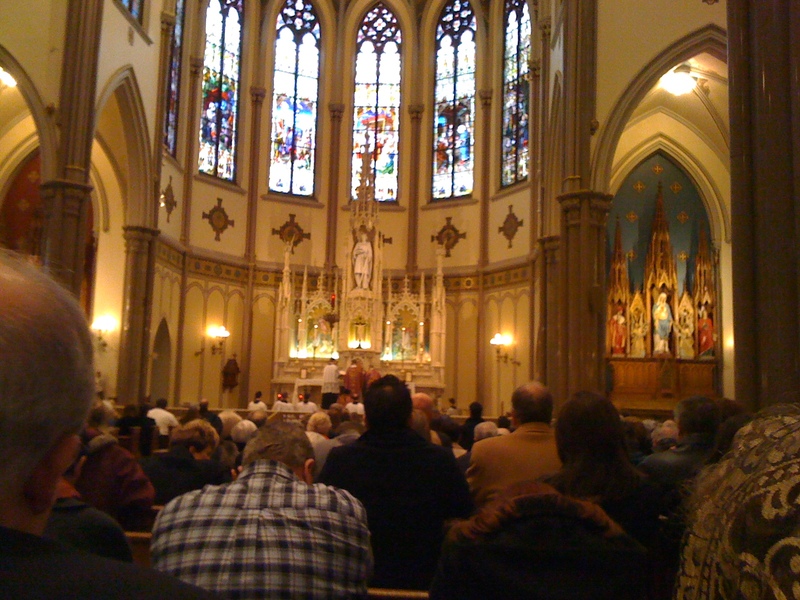 (Buffalo has far more beautiful churches than Rochester). I was impressed to see listed as acolytes and torchbearers so many Buffalo seminarians. I hope they learn to celebrate the Traditional Latin Mass as future priests. Yes Jim, it was very encouraging to have so many seminarians agree to do this. Even before they become priests, when some of them are elevated to the Diaconate, it will make future Solemn Masses much more likely. Ideally speaking, actual clerics should have the most important roles and laymen should be the torchbearers and acolytes. In a few years this may be possible. I attended this mass and found it profoundly moving. I took my mother and her sister, both of whom are in their eighties. It brought back wonderful pre-Vatican II memories for them. The singing was exquisite. I felt really fortunate to be able to attend. I sat up front and was able to enjoy the beauty of the vestments and the church itself. I hope there are more Masses like this in the near future. In the Choir Loft, that is great that a group of you came in from Rochester! I will bet Rochester has amazing churches too. (You do have House of Guitars so that is something anyway.) From what I hear that Traditional Latin Mass is catching on among seminarians and younger priests... we will have to keep our fingers crossed! So glad you could come and celebrate this with us. Bill, our girls (my nieces, Rosie and Millie) liked the music too. The real adventure for them was having to go up and kneel at the Communion rail ... all they knew was Communion in the hand! I had not realized that. I thought Father Nogaro handled all those logistics gracefully, explaining how things would be done. I would love to see more of this and now I am starting to hope! Yourstil, I love that video! I almost saw myself in it! But alas, I am blocked out by the guy in the red plaid shirt. That's great you got to sit in front. You're right, those vestments were beautiful. Such a feast for the eyes and the ears..